The engineering multinational piloted a training program for asylum seekers in a small German town. A triple win program, the initiative is being scaled from 10 to 100 placements across Germany. The program was set up in partnership with the City of Erlangen, as part of a campaign to counter misconceptions about refugees. German engineering firm Siemens introduced an eight-week internship program in early 2015. The interns are highly-skilled, multilingual, experienced, and refugees. They’re not always considered highly skilled, but that’s what many refugees are: Former engineers, nurses, or teachers forced to leave their homes. When refugees enter a safe country, many are eager to get jobs. Finding work can be difficult, in part due to immigration status, but government restrictions on work are not always the cause. Even when refugees are legally able to work, they can face barriers in the form of misperceptions that they are low-skilled, traumatized, or not ready. Whatever the reason, refugees typically face long waits before reentering the job market. This strains refugees, companies in need of skills, and economies. Siemens AG, a multinational technology engineering firm with headquarters in Berlin and Munich, is bridging the gap between arrival and employment. Its pilot internship program for refugees began in Erlangen, a Bavarian city with 1.2 million metropolitan residents, 15 per cent of whom are non-Germans. 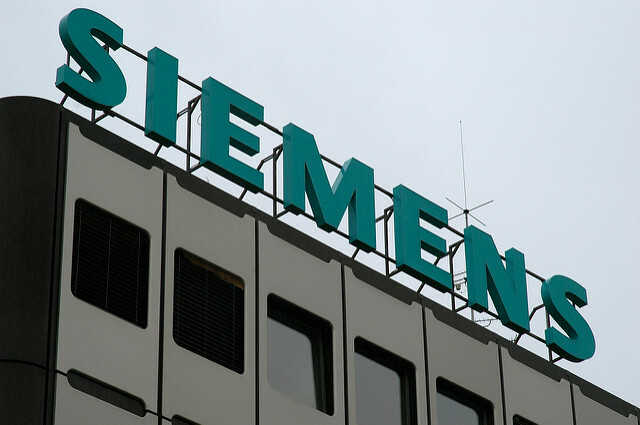 Siemens targeted its internships at asylum seekers, meaning those whose legal status is still being determined in what can be a lengthy judicial process. The idea to bring refugees into the Siemens workforce originated through partnership with the local government and its city-wide campaign to improve integration of newcomers. The campaign is part of a wider European initiative called C4i (communication for integration) aimed at countering rumours about immigrants. As a major employer, Siemens has a big role to play. Although a larger city in metropolitan terms, Erlangen proper is home to just 100,000 residents. Siemens employs 23,000 people in the area, or roughly a quarter of Erlangen. The pilot involved two main parts: Creation of the internship placements and development of a company-wide support network. The internship placements were straightforward enough. Siemens created real training positions in units that needed support, said Irma Paringer, the Diversity Manager at Siemens responsible for helping to implement the pilot, select candidates, and scale the program. A unique element was creating spots with a candidate in mind. The interns therefore had a role suited to their skills, while filling a real need and contributing directly to a team. The company worked with the city government in an ongoing effort to source its interns, relying on city staff to identify highly skilled candidates specialized in engineering, healthcare, medicine, biology, and chemistry – the company’s main focus areas. Paringer said this step is a priority and can be a challenge. There is no shortage of qualified candidates, but there is a need for a better data collection on refugee skills and a system to match them to employers. Next on the administrative side, German law required Siemens apply for work permits on behalf of the candidates. The full-time interns received minimum wage. The big departure from standard internships was a complementary support infrastructure for each intern, his or her team, and the company’s staff as a whole. It was ambitious and multi-layered, involving a buddy program, employee awareness trainings, public relations, and monitoring and evaluation meetings. The focus on internal training is an innovative approach, and high-impact, considering the size and reach of the Siemens workforce in Erlangen. The buddy program is a key feature of the support network, structured a bit like an intensive mentorship program. Buddies are Siemens employees who volunteer for the role, to support their new colleagues and get them familiarized with day-to-day work and company culture. They are part tour guide, part mentor, and part friend. Buddies are a trusted point of contact, who also undergo training to be communicators among other Siemens employees. Equipped with information about who the refugees are, as well as demographic and labour market statistics, buddies have facts on hand to take questions from colleagues and present the business case for why Siemens (and Germany) needs new talent. Another key feature is training for Siemens staff, led by the company’s human resources team. A typical workshop convened a small team or unit at Siemens, along with the new intern and buddy. Training topics included workforce diversity broadly, and refugee and settlement issues in particular. Asked about the number of refugees worldwide, employees might hazard a guess around one million, and then learn the real number is around 60 million. The workshops were heavy on facts (“The engineers love that,” Paringer added), and also aimed to make a point. Paringer gave this simple exercise as an example: She asked everyone to form a line, beginning with the person who spoke the fewest languages, and ending with whomever spoke the most. After the line of polyglots formed, staff members almost always turned around to find the refugee at the back – fluent in more languages than the Germans. Such a simple exercise has the power to demonstrate potential. The message Siemens sends down the pipeline is that this is a win-win relationship. The company gives refugees an opportunity, and in return, it gets highly qualified workers with a lot to contribute. Paringer said the value for the company is clear. Diversity means more solutions and more creativity. Tapping diversity can require some engineering. In a politically charged environment in Germany, it requires taking a clear position on values. “We want to have a new culture, that’s based on inclusion, tolerance, and valuing different people,” said Paringer. Building a culturally diverse, inclusive employee base and increasing awareness of other cultures can help the company succeed in terms of understanding its own market, local and global. Bringing refugees into Siemens fits the company’s diversity strategy, which embeds diversity in another company value of collaboration. “Working together is not always easy, but it brings the best output and innovation for the business,” Paringer said. The value for the interns is clear too. They reported having gained the opportunity to develop and test their skills in a German company, as well as improve their language and cultural competency. Interns left with a larger network and enduring mentors, and a better sense of career goals and what new education or training they need to achieve them. Although Siemens is not currently hiring the refugees upon completion of the program, Paringer noted that this may change. In the meantime, the interns can add German experience and references to their resume. As the number of refugees entering Europe grows by the day, Germany receives a growing number of refugee applications compared to previous years. When Siemens launched its training program in 2015, Erlangen had two refugee shelters serving about 200 refugees. At the end of 2015, the number swelled to over 30 shelters coping with 2,000 and the arrival of 70 newcomers each week, according to the City of Erlangen. The company is now in the midst of rolling out the program to ten Siemens locations nationally – Berlin, Hamburg and Munich among them, and is planning for up to 100 new internship placements in 2016. This represents an investment of 2 million Euros. Other initiatives complement the company’s engagement with refugees, like housing. In 2014, the company vacated two Munich office buildings to loan the city government for accommodation, a feat Siemens is repeating, and expanding, in 2015-2016. Siemens also introduced an incentive for its employees to get involved. Employees who volunteer with refugee aid organizations are eligible for an additional five paid leave days. The Siemens model is drawing attention from other German cities and large companies in Germany and across Europe. Begin small and scale. Siemens launch in Q1 2015 with two internships, and scaled to 10 in May 2015. In October 2015, it announced the expansion to up to 100 placements in the coming year. Have community partners. Siemens tackled an early problem of identifying highly qualified interns by partnering with City of Erlangen staff. Communicate to employees. Provide information sessions and workshops that help create cultural awareness throughout the company. Find creative, clear ways to demonstrate the potential of refugees to their colleagues. Emphasize that they are highly qualified employees who happen to be refugees. Promote company values. Embed the program within a company-wide vision or strategy and communicate how the program meets strategic goals, and what the specific benefits are for the refugees, employees, and the company. Siemens identifies with the refugee experience. The company was displaced during the Second World War. It set up a factory in Erlangen following bombardment of its original sites in Berlin in 1940. Erlangen Case Study on developing a traineeship program modeled on the Siemens experience.